What is a NUCCA chiropractor? NUCCA practitioners are chiropractors who complete post-doctorate education through the National Upper Cervical Chiropractic Association. This is facilitated by way of biannual conferences, private internship, and mentor relationships. Qualification is objectified by way of the NUCCA Certification Program. Just as there exist different surgical approaches among orthopedists and neurologists, or different philosophies regarding occlusion among dentists, within chiropractic there exist different protocols and ideologies regarding spinal care. NUCCA practitioners deal exclusively with the biomechanics and structural relationships within the upper cervical spine, utilizing a set of protocols that differ substantially from common chiropractic practices. For answers to more specific questions regarding upper cervical chiropractic in general and the NUCCA procedure specifically consider viewing "Craniocervical Chiropractic Procedures" and Frequently Asked Questions for Providers. 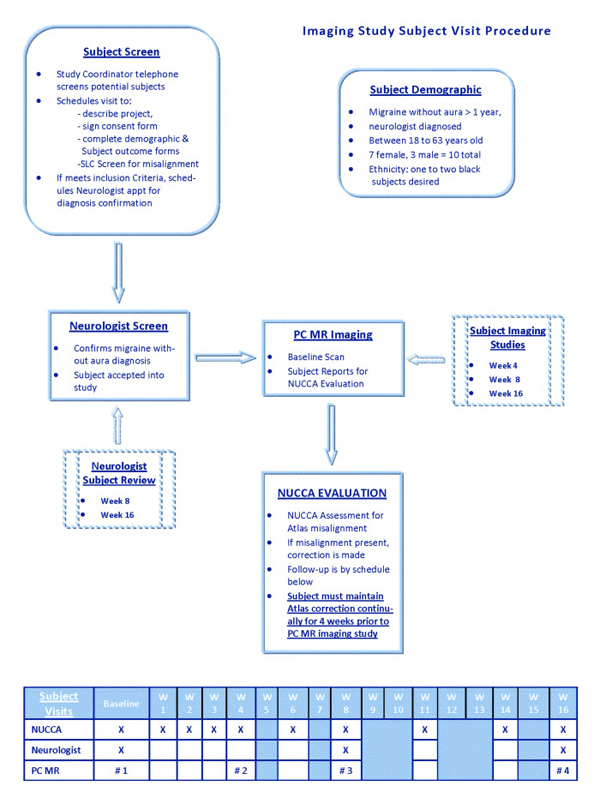 Also see NUCCA's Standards of Care and Practice Guidelines. What is the Atlas Subluxation Complex? While there is no medical equivalent to the Atlas Subluxation Complex (ASC) that matches the depth of chiropractic clinical understanding, many practitioners will be at least somewhat familiar with cranio-cervical syndrome. This is a good place to start for those interested in exploring the upper cervical spine and the symptoms and conditions that can result from dysfunction. 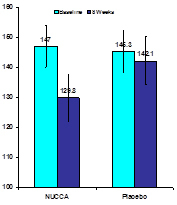 Also see A Brief History of the Modus Operandi of Measuring and Correcting the Atlas Subluxation Complex Syndrome. Where is the evidence for NUCCA? There is a logical chain of arguments that support specific upper cervical work. This chain is supported by some evidence at each link, with the evidence for some aspects being stronger than others. 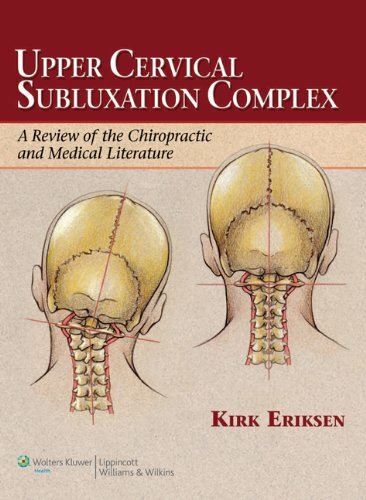 Given the anatomical, biomechanical and neurological complexity of the upper cervical spine, specific upper cervical work is an appropriate approach to adjust the upper cervical subluxation. While upper cervical chiropractic, as a distinct perspective in chiropractic care, is far from new, the growing public awareness of it is. Realizing the importance of conforming to the accepted standards of validation in the medical community, upper cervical researchers and organizations like the Upper Cervical Research Foundation (UCRF) have taken on the arduous (and expensive) task of bringing decades of chiropractic research into the world of peer-reviewed medical literature. 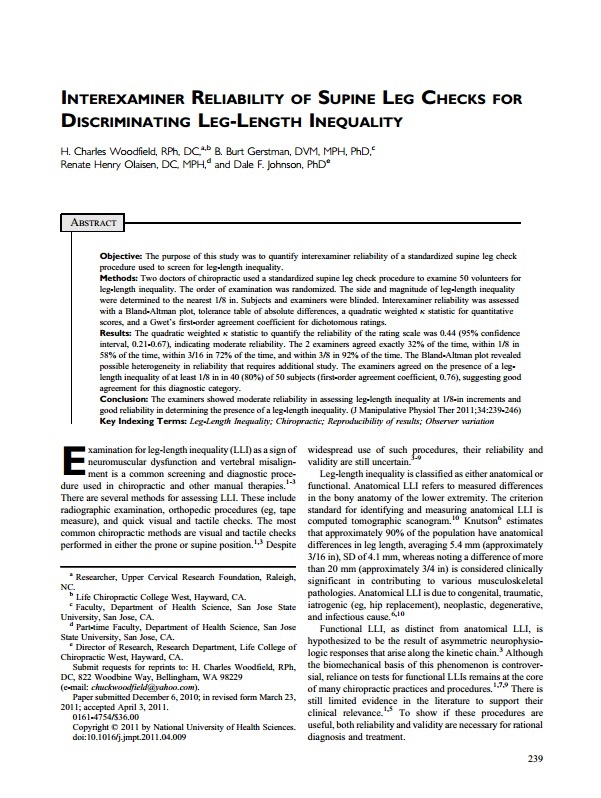 Research like Dr. Dickholtz's blood pressure study published in the Journal of Human Hypertension, as well as the research of Dr. Scott Rosa and others on Chronic Cerebrospinal Venous Insufficiency, has done much to catch the eye of both the public and research communities. 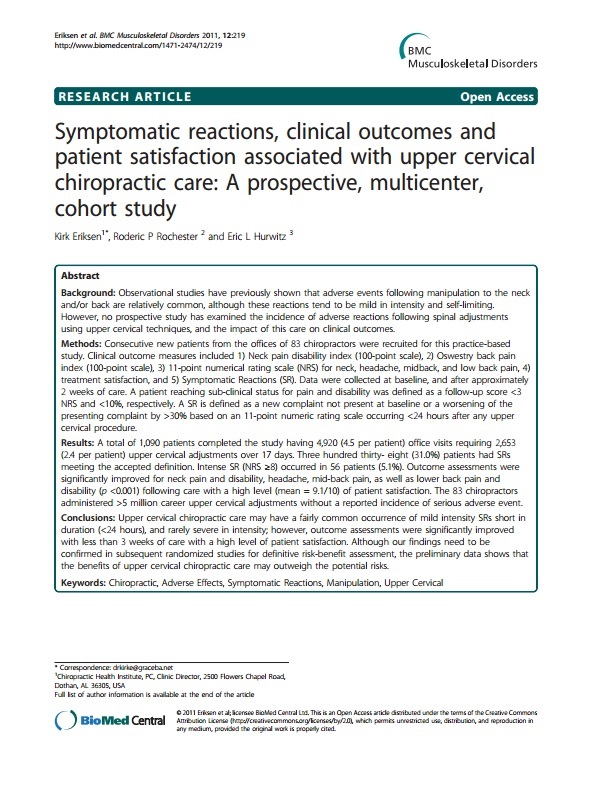 While the validation of specific upper cervical chiropractic procedures and protocols via the medical peer-reviewed research route remains an important and ongoing task, the existing body of literature supporting the methods employed by NUCCA practitioners will provide anyone with genuine interest in the matter a convincing body of evidence in support of the use of the NUCCA procedure for the purpose of optimizing human physiological potential. The resources included in this page's sidebar will be helpful for those interested in orthogonal upper cervical chiropractic. 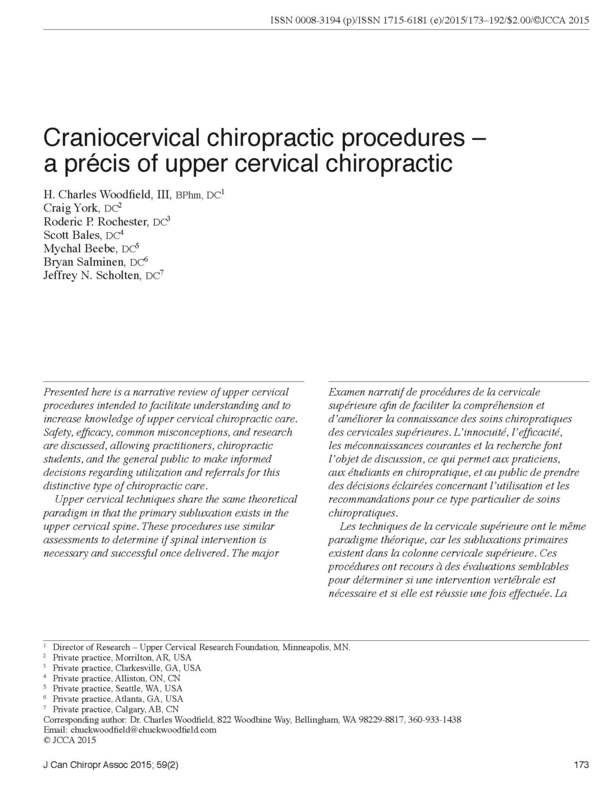 A review of upper cervical chiropractic procedures. A review of the chiropractic and medical literature. The relationship between nonsurgical interventions to align the Atlas vertebra and changes in blood pressure and heart rate. 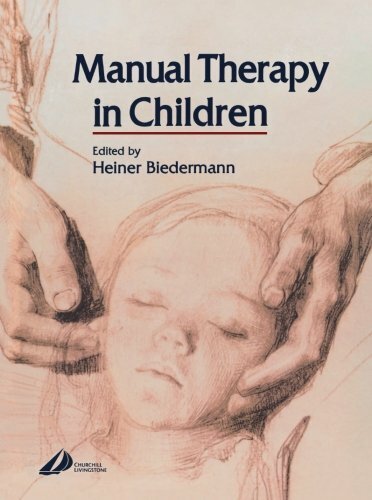 Dr. Hiener Biedermann's research on atlas realignment in children.